We are pleased to have integrated yogen früz gift cards with our new yogen früz app for iOS and Android so that can bring you even more exciting offers and contests. Earn points every time you spend and swipe your yogen früz gift+points card or scan your eCard on your smartphone. Plus you can earn bonus points through contests and on your birthday. WHERE CAN I GET A FRUZ®NATION CARD OR THE APP? You can ask our team members for a fruz®Nation card to start collecting points at any participating yogen früz store. They can usually be found near the cash register and functions both as a rewards card and gift card. The app you can download for FREE simply by searching for yogen früz on the Apple App or Google Stores. If your local yogen früz does not have any fruz®Nation cards available, send us an email at info@yogenfruz.com. When you pay at the cash, we swipe or scan your fruz®Nation card which sends the points to your account automatically. You can log into your account via our website at yogenfruz.com/u-reward/login/. Once you register your first fruz®Nation card, you automatically receive an opt-in email to join the rewards program, with the option to unsubscribe and never receive another notification. We will never share or use any customer information other than for the purposes of administering this gift+rewards program or any other way that you may opt-in for. 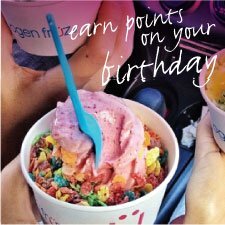 You can then use your points at participating yogen früz stores to pay for your purchases as soon as you have earned a FREE TREAT (worth up to $5). Just present your fruz®Nation gift+rewards card to the cashier and let them know that you wish to redeem a FREE TREAT. Have a frotastic day and enjoy the treats that come with being a member of the froyo®Nation!